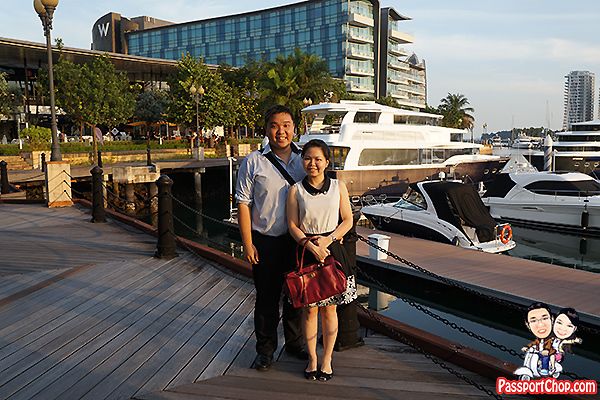 Sentosa has always been a convenient weekend mini-holiday getaway destination for us (e.g. Resorts World Sentosa, Siloso Beach) but recently we had started to check out another happening and interesting side of Sentosa island – Quayside Isle at Sentosa Cove. When I heard that Quayside Isle is within the renowned Sentosa Cove estate – one of the world’s most exclusive marina residential communities, I thought that dining at any one of the waterfront restaurants at Quayside Isle would break the bank since this is such an atas area. 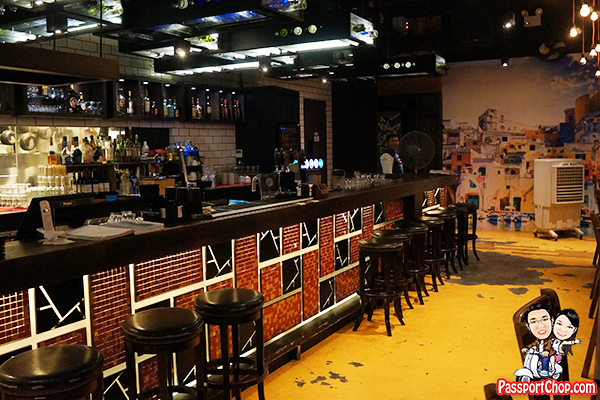 Surprisingly, dining at Quayside Isle does not cost as much as if you were to dine at a restaurant in the Clarke Quay, Orchard or Dempsey area! 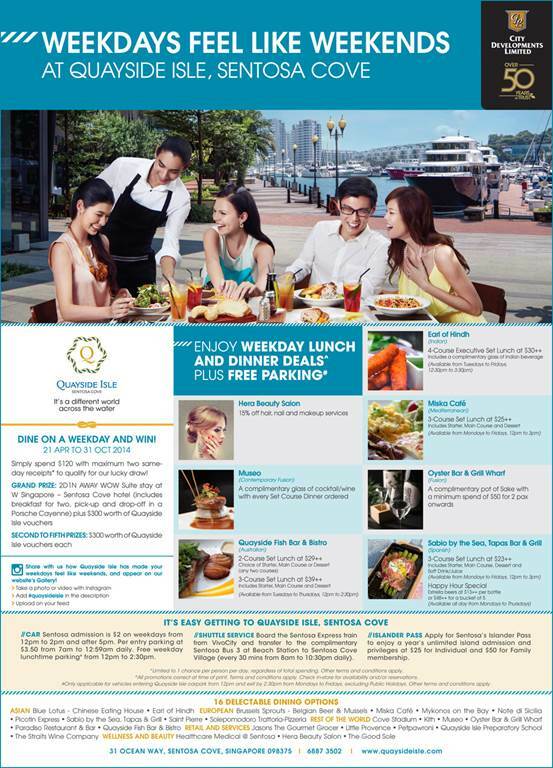 For the best value for money dining at Quayside Isle, I recommend that you check out Quayside Isle Weekdays Feel Like Weekends promotions! Not only can you enjoy affordable set lunches, you can even participate in a lucky draw to win attractive prizes! With a minimum spending of $120 in maximum 2 same-day combined receipts on weekdays from now till 31 Oct 2014, each shopper/diner will be entitled to enter the Quayside Isle Weekdays Feel Like Weekends Lucky Draw with one qualifying chance, regardless of total amount spent. The Grand Prize? An Away Wow Suite at W Singapore – Sentosa Cove hotel (including 2 breakfasts, and pick-up and drop-off in a Porsche Cayenne) and $300 worth of Quayside Isle vouchers! The 2nd to 5th Prizes are just as attractive with $300 worth of Quayside Isle vouchers each up for grabs. 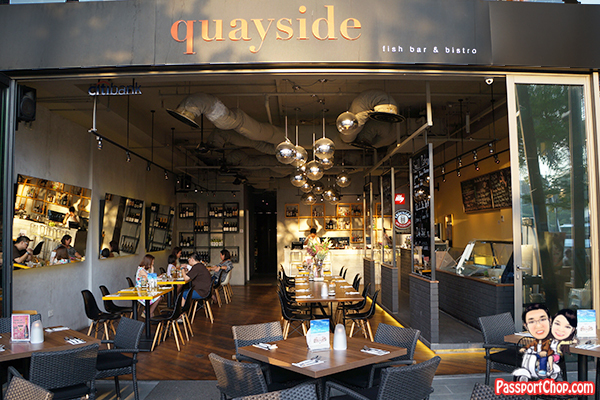 So if you work nearby or in the city area, why not try dining at Quayside Isle with your colleagues – either drive down (10 minutes from CBD) or share a cab. Do note that Sentosa admission is only $2 per car on weekdays from 12pm to 2pm and after 5pm. Bring along your Sentosa Islander pass if you have one as pass holders enjoy unlimited free entry to Sentosa. There is also free weekday (except public holidays) lunch time parking at Quayside Isle. There is no minimum spending needed. Simply enter the carpark from 12pm and exit by 2.30pm from Mondays to Fridays and you will not be charged for parking! Before I show you more about our dining experiences at Quayside Isle, I have another great exclusive deal to share with our readers – a chance to win $200 worth of dining vouchers! 2 Winners will each win $100 Quayside Isle Vouchers + $50 Sabio by the Sea, Tapas Bar & Grill Vouchers + $50 Earl of Hindh Vouchers. Winners will be randomly picked and announced at @passportchop and @Gushcloud_SG Instagram on 1 Oct 2014. One of the things we missed most from our trips around the world is the yummy local cuisine from tapas and paella in Spain to fresh Australian seafood. We were so glad that we can find some of the best and authentic Spanish, Indian, Australian, Japanese and even Mediterranean cuisine at Quayside Isle – all within a few steps of each other! Cuban-themed Paradiso (which means “paradise” in Latin) Restaurant & Bar serves up Spanish cuisine in an intimate rustic-chic setting (with Latin influences). 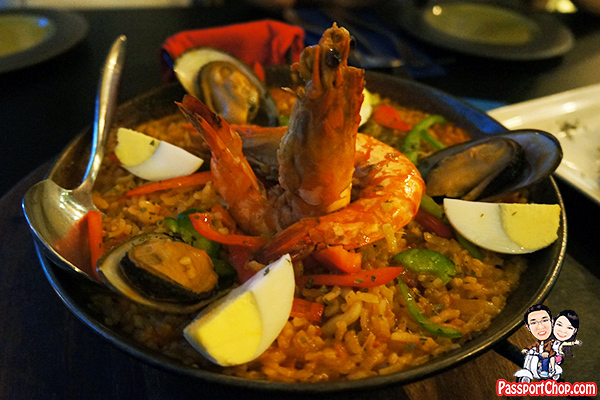 I strongly recommend Paradiso Restaurant & Bar’s Classic Seafood Paella Valenciana ($34+). This is a seafood mixture of prawns, squid, mussels, fish & daily vegetables. Cooked together with authentic prawn stock & premium Arborio rice for a period of time, the flavours are allowed to merge and mingle and be absorbed into the rice. This dish is as authentic tasting as the paella you can find in Spain! Allow for about 20-25 minutes cooking time – it is worth the wait! We also loved the Pan Fried Seabass ($24+) served with spicy poached onion cream sauce and sides of potatoes and garlic. I am very concerned about trying fish dishes in restaurants because if not prepared well, there might be a lingering fishy smell but you get none of that here at Paradiso Restaurant & Bar – it was a very fresh and satisfying pan fried seabass dish! Paradiso calls their Dulce de Leche Tiramisu ($12+) a “crowds’ favorite tiramisu” and they are absolutely right – both of us loved it! This tiramisu fused the Argentina and Italian tiramisu making tradition with a delicious caramel twist. You can definitely expect to taste the rich sweetness of dulce de leche. At Paradiso Restaurant & Bar, you don’t have to pay the usual 10% service charge levied by many restaurants – just pay the 7% GST on top of the quoted menu price! This makes dining at Paradiso Restaurant & Bar much more affordable! Opening Hours: 5pm to 11pm (Mon), 11am to 11pm (Tues-Thurs), 11am to 1am (Fri-Sat), 11am to 11pm (Sun). Last order for food is at 9.15pm daily. Timings accurate as at time of print. Please call Paradiso Restaurant & Bar at +65 66945428 to check for updated opening hours. Spanish tapas bar Sabio by the Sea, Tapas Bar & Grill offers an authentic tapas experience along with an additional grill menu, with a spacious and relaxing ambience. 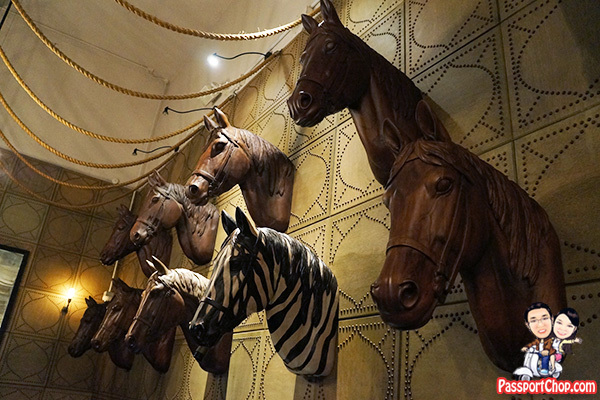 What caught my eye was the restaurant’s interesting and beautiful restaurant décor. Sabio by the Sea offers a great selection of salads – personally, I like the Ensalada de Pincho Moruno de Pollo ($17++) i.e. 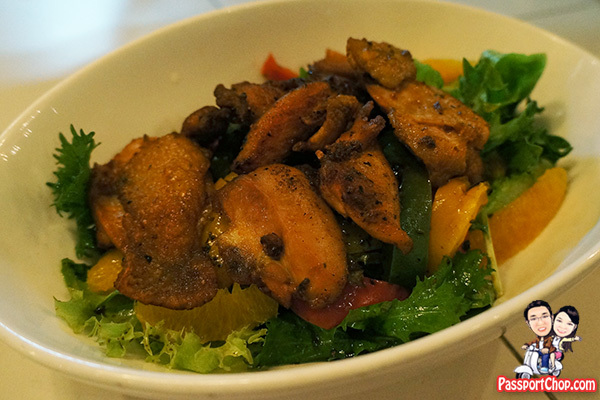 Marinated and Grilled Chicken Salad, served with Capsicum and Orange. It was quite a filling dish and tasted great. 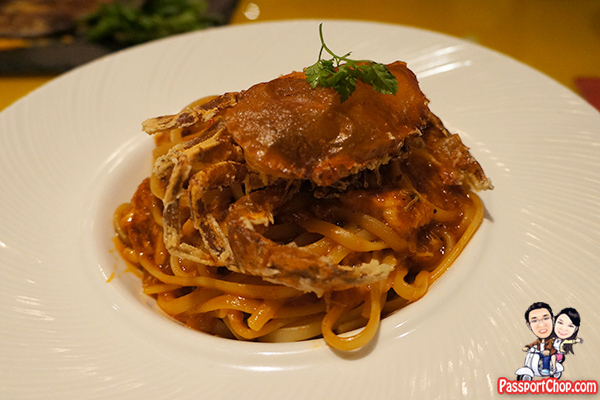 Their weekday set lunches (available Monday to Friday 12pm to 3pm) are very value for money as it is priced at just $23++ for a three-course meal. 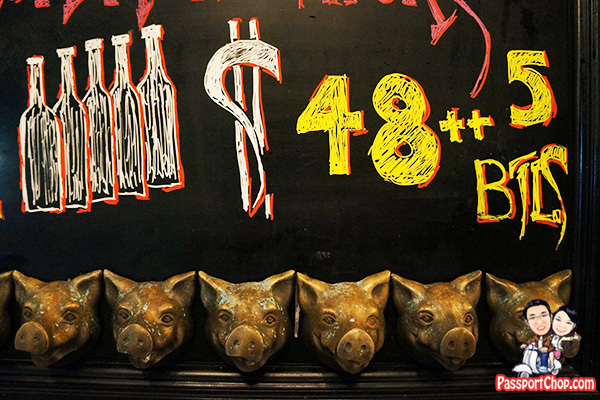 You can also add $5++ to enjoy a glass of refreshing Red/White Sangria with your set lunch. For starter, you have a choice of Mushroom Soup or Vegetarian Salad (with goat cheese – add $3) or Cold Cut Platter. For main, you have a choice of Mixed Grilled Vegetables with Extra Virgin Olive Oil or Gambas “Pil Pil” or Pincho Moruno. I strongly recommend the Pincho Moruno. 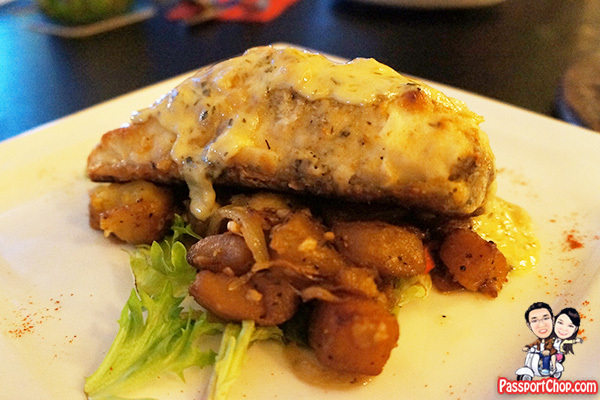 It is Grilled Chicken with Roasted Garlic and Melted Manchego Cheese. Manchego cheese is a popular cheese in Spain, produced in the La Mancha region and made from sheep’s milk. 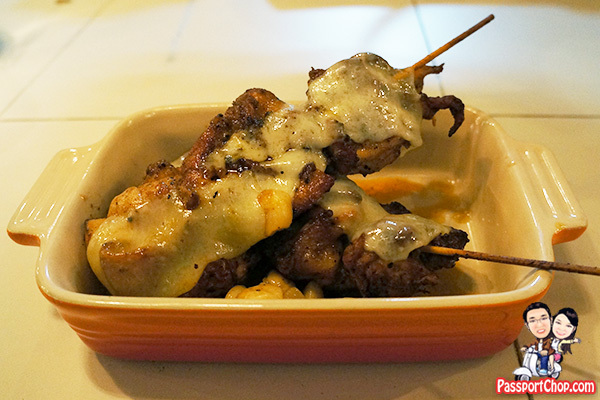 Each portion comes with 2 skewers of grilled chicken. For dessert, you have a choice off Churros or Crema Catalan. You will also be served hot coffee/tea. 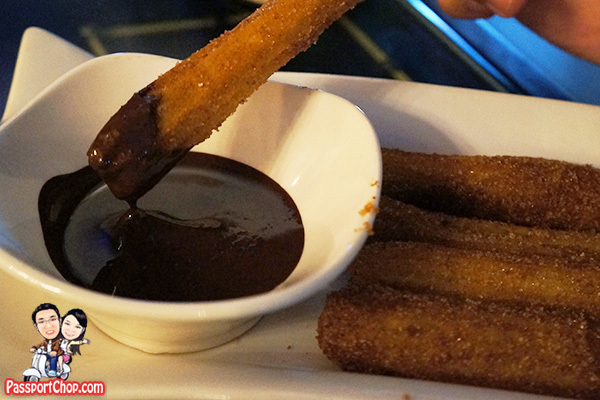 Take the Churros, you will get 2 pieces of Spanish doughnuts per portion and it comes with hot chocolate for dipping. With their weekday set lunch promotion, it’s a combination of a satisfying and delicious meal that comes with great savings! Timings accurate as at time of print. 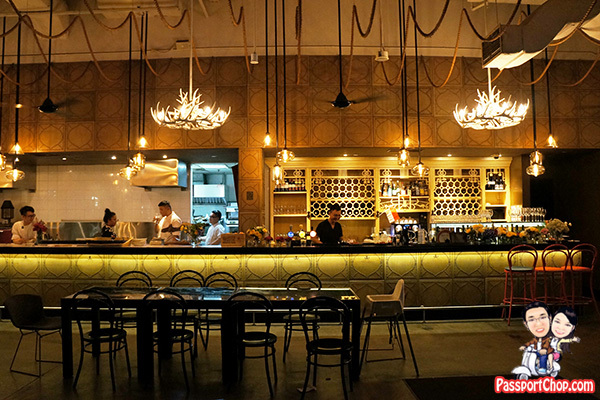 Please call Sabio By The Sea, Tapas Bar & Grill at +65 66907568 to check for updated opening hours. 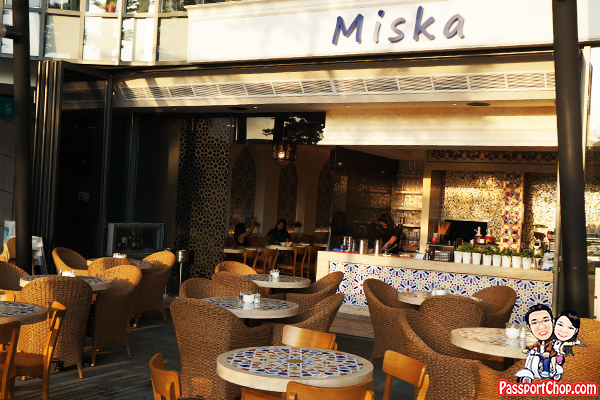 With Mediterranean influences in both its décor and food, you can experience an authentic yet modern experience at Miska Café through a creative Mediterranean menu that combines fresh products, homemade sauces and dressings, a subtle blend of spices and exotic flavours. 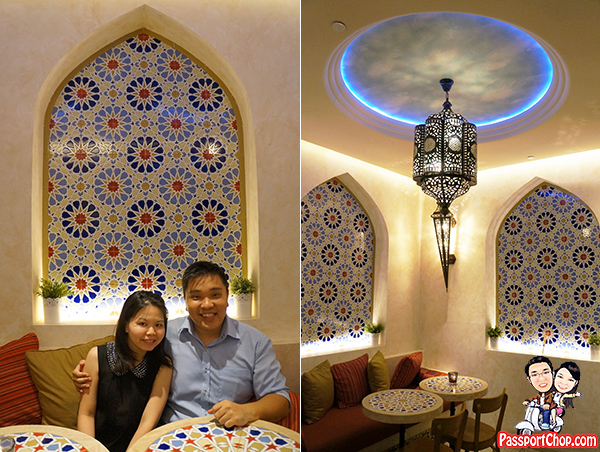 I really like the Mediterranean-themed interior design – brings back memories of our trip to Turkey! 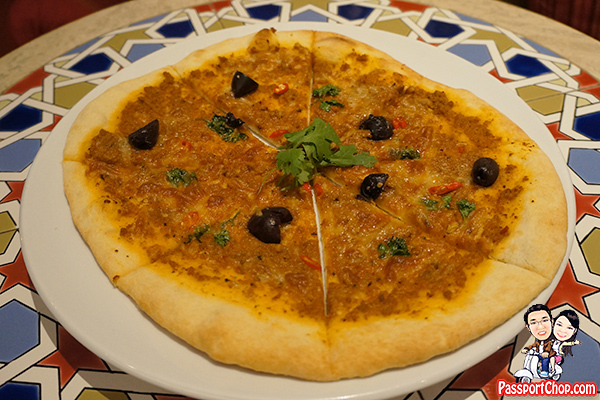 Try the 3 P’s here at Miska Café – Pasta, Pita and Pizza – very tasty and worth it. Miska Café offers a 3-course weekday set lunch at $25++ where you can get a starter course (small salad) and a main course (varies every week and chosen by the chef) and dessert. You will also be served with either a glass of juice or fresh fruit salad. 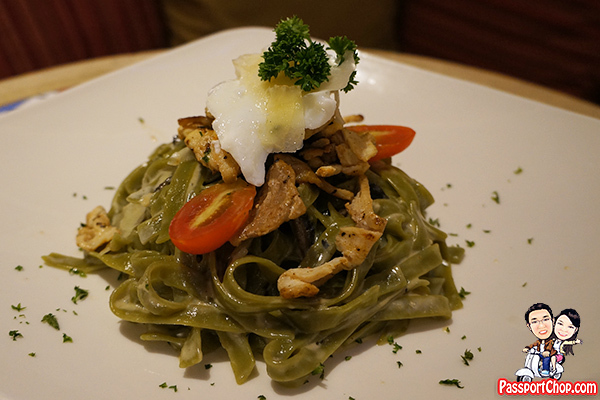 I recommend Miska Café’s pasta dishes especially the Arrabiata ($22++) – spaghetti served with spicy tomato sauce, olives, topped with parmesan cheese and choice of beef or chicken kebab. Vegetarian options are available for this dish. 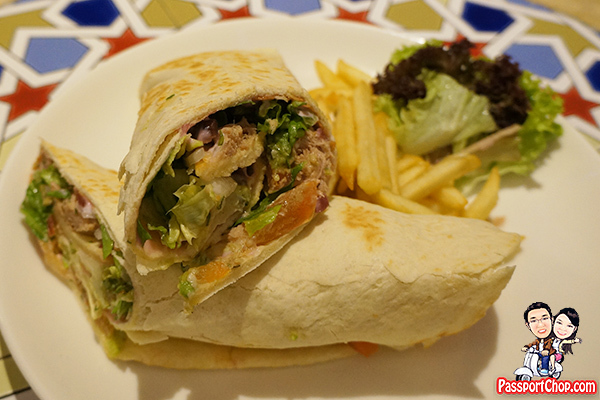 Miska Café’s pitas and wraps are freshly baked daily and served with fries and slaw. The Tuna & Avocado Wrap ($22++) – comprising mix tuna, avocado, onion, chili, dill and tomato, rolled with beetroot dressing and salad – is quite big in serving size. Taste great too. On to the last P – pizza: the Klymali ($22+) – a special mix of herbs, spices and premium quality mince beef with in house pizza toppings. Timings accurate as at time of print. Please call Miska Café at +65 63390903 to check for updated opening hours. Having experienced European cuisines, we move on to the other side of the world with Japanese, Indian and Australian cuisines. If you have a craving for oysters, Oyster Bar & Grill Wharf is the Quayside Isle restaurant to check out as they offers an extensive selection of the establishment’s signature fresh oysters handpicked from all around the world. 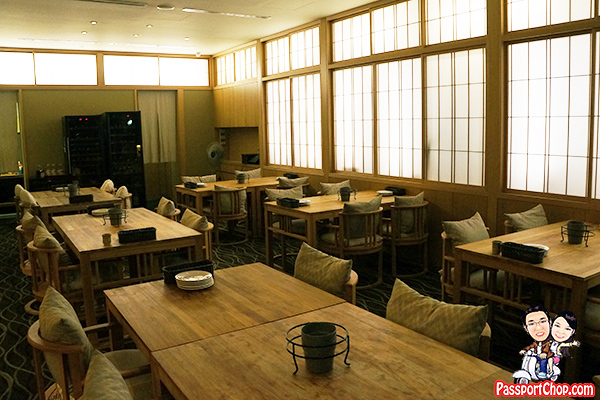 There is also an array of Western & Japanese dishes, grills, tapas and seafood. 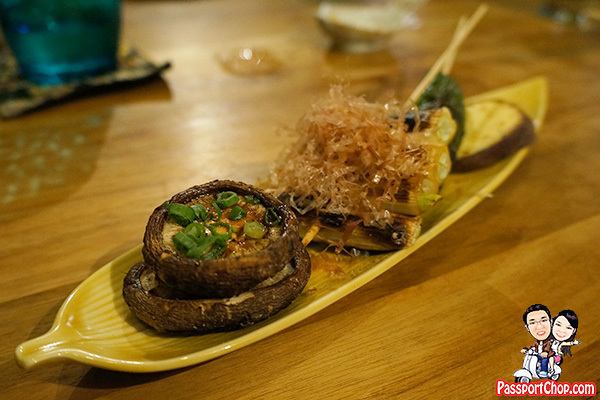 If you can’t get enough of Spanish tapas, you can try the Japanese tapas here e.g. grilled shiitake mushrooms, edamame. I was quite overwhelmed by Oyster Bar & Grill Wharf’s 100 different flavours of mojitos and international collection of a hundred varieties of wines. Check out Oyster Bar & Grill Wharf Quayside Isle’s website for promotions e.g. you can find a voucher for a complimentary mojito on your next dinner here: http://www.dinelike.sg/sentosa/p1008. Just so you know, Oyster Bar & Grill Wharf’s fresh oysters are flown in daily from around the world. 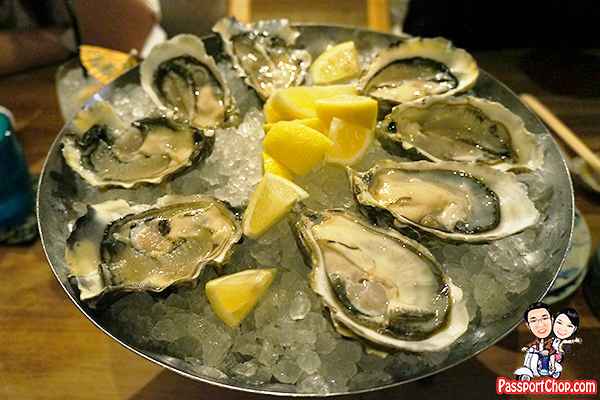 When we visited Oyster Bar & Grill Wharf, we got to try the restaurant’s signature dish – Fresh Oyster Platter – that comprises of USA Pacific Oysters and Canadian Fanny Bay Oysters. Fanny Bay is well known for producing the best oysters around the world! For half a dozen (6 pieces), you pay $36++ and if that’s not enough for you, go for a dozen (12 pieces) for $69++. Personally, I liked the Canadian Fanny Bay oysters more because they tasted sweeter; the USA Pacific oysters tasted saltier. 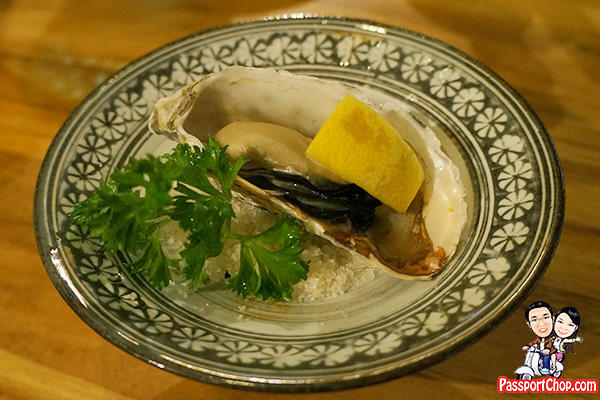 The oysters from the two different regions also looked different – if you see the picture below, separated by the column of sliced lemon on your right is the Canadian Fanny Bay oysters and on the other side USA Pacific oysters – the shells of the Canadian oysters are much smoother than that of the American ones! 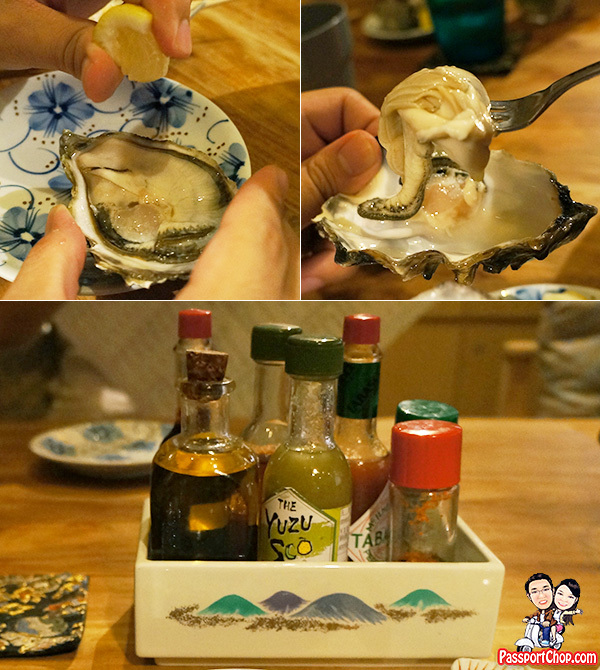 The Charcoal Grilled Oysters (from New Zealand Kaipara) also taste great (1 piece for $8++; 4 pieces for $28++); if you don’t like the raw taste of oysters, this is a good alternative oyster dish to try. Another interesting aspect of dining at Oyster Bar and Grill Wharf is the live on-the-spot charcoal grill Kushiyaki. You might be more familiar with the term – yakitori which typically refers to skewered grilled chicken; Kushiyaki encompasses both poultry and non-poultry skewered grilled items. 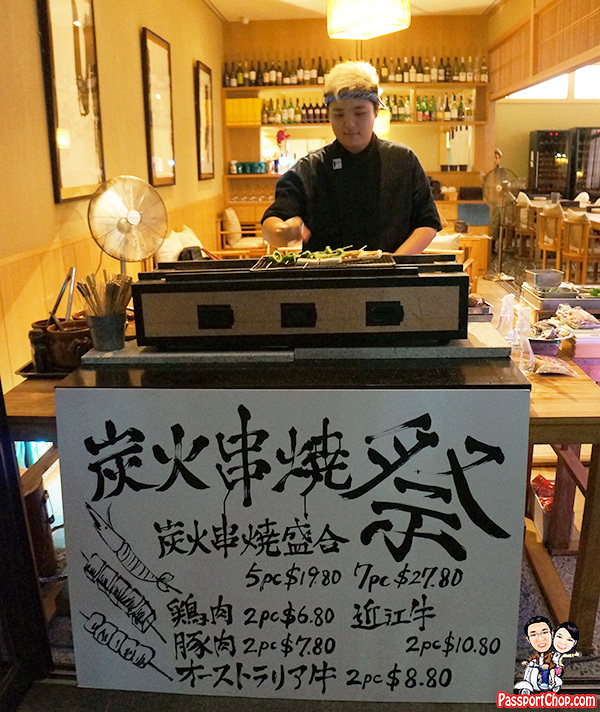 The restaurant offers Kushiyaki from now till mid-Sept as it is summer in Japan and Kushiyaki is only available during summer. 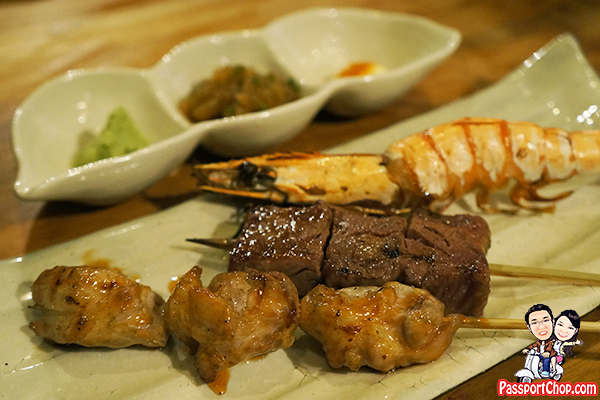 I loved the assorted Kushiyaki selections – my personal favorite is the melt-in-your-mouth grilled beef – the Omi beef (must try!). Opening Hours: Lunch – 12pm to 5pm (Sat, Sun and Public Holidays only – last order: 4pm); Dinner – 5pm to 11pm (everyday – last order: 10.30pm). Timings accurate as at time of print. Please call Oyster Bar & Grill Wharf at +65 63396779 to check for updated opening hours. 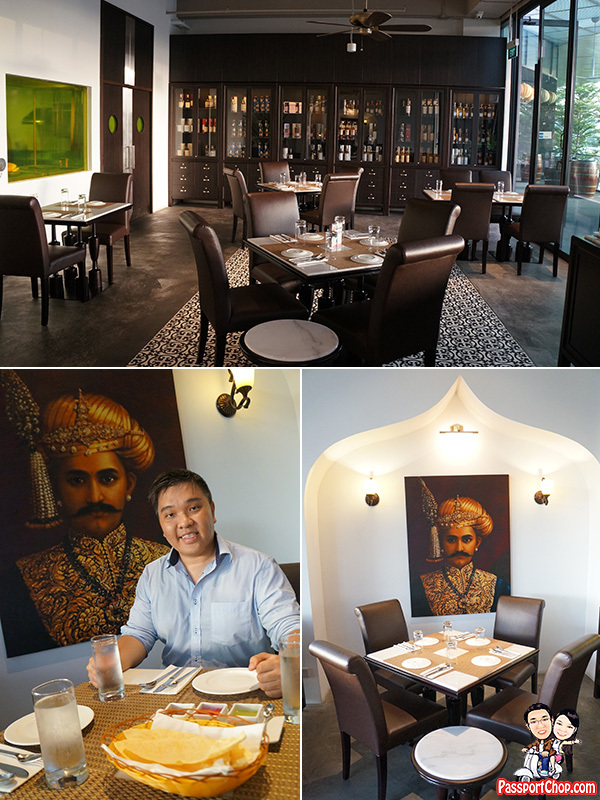 Located on the 2nd floor above the Quayside Isle restaurant row (where Miska Café is located), Earl of Hindh is a fine dining restaurant that that provides delicious Indian fare. The menu includes a delectable range of varied grilled Indian kebabs, Indian curries, breads and long grained basmati rice prepared with the most exotic spices. Before my trip to India’s Srinagar and Udaipur, the only Indian food I have tried was roti prata but the trip opened up my perspectives to the wide range of delicious Indian food – the tasty curries and fragrant breads. I was thus glad to relive such fine Indian cuisines again at Earl of Hindh. By now, you would have noticed the common theme across Quayside Isle restaurants – beautifully designed restaurant décor themes that makes you feel as if you are dining at the country itself. This is also true for Earl of Hindh as can be seen from the pictures below. … to Murgh Malai Kabab ($28++) – creamy kabab of boneless chicken blended with cream, cheese, lemon juice and green coriander, grilled in a moderately hot tandoor. I strongly recommend the Murgh Malai Kabab (chicken) and Mutton Seekh Kabab (lamb) – so tasty and tender (melts in your mouth feel). 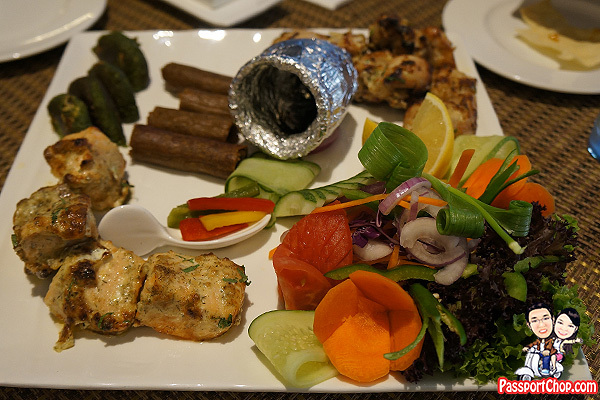 Do note that this is a sampler platter – the actual servings per starter are much more. 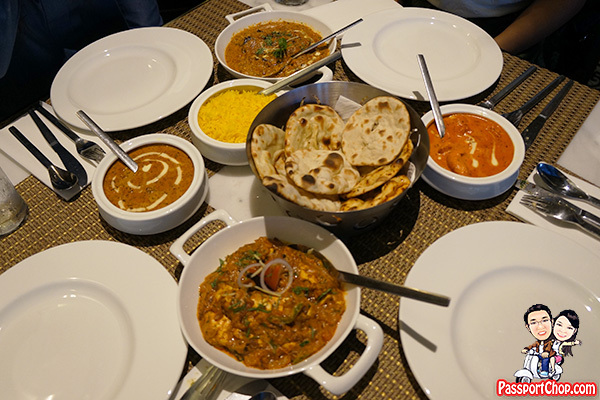 Going on to the mains – the dining experience in India was quite overwhelming for me as you get a wide selection of breads (rotis, naans) and curries – over here at Earl of Hindh, you will also experience a huge number of choices! … to Maa Ki Dal Makhanwali ($18++) – a harmonious combination of black lentil, kidney beans, tomatoes, ginger, garlic, simmered overnight on a slow charcoal fire and finished with cream, served with a dollop of unsalted white butter. I strongly recommend the Maa Ki Dal Makhanwali and Murg Makhani – very addictive and taste great with the basmanti rice and all the naans and rotis! 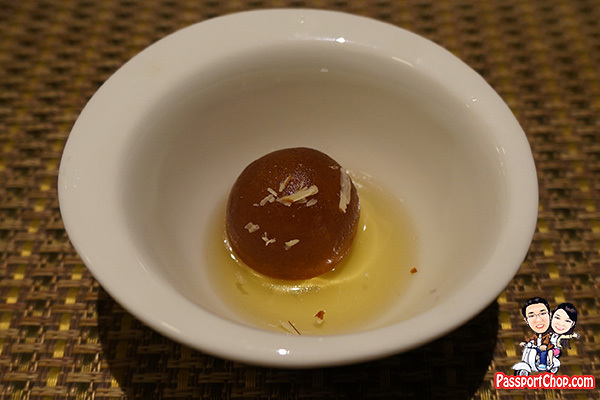 For dessert, if you have a sweet tooth, I recommend the Jamun E Gulab. These are reduced milk dumplings filled with pistachio and cardamom, fried in “Ghee” and dipped in rose and saffon perfumed sugar syrup. Just by reading how it is prepared, you will realize that it has a lot of saturated fat and sugar so if you are watching your diet or a diabetic, you might want to avoid or eat in moderation. 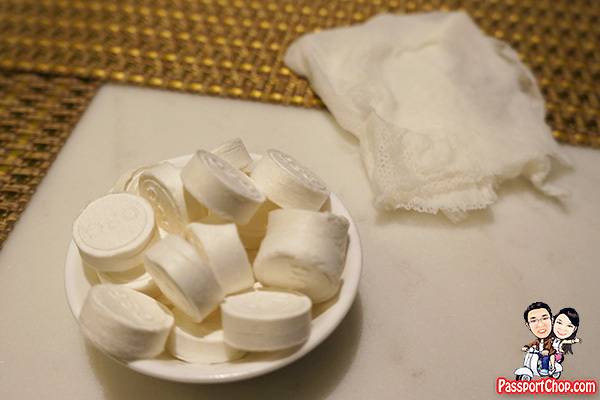 The small white things in the picture below are not mints! They are actually compressed wet tissues. The Earl of Hindh servers will put one of these on a small plate and pour water on it and it will expand to become a piece of wet tissue – makes for some post-dinner mini-entertainment. Timings accurate as at time of print. Please call Earl of Hindh at +65 66816694 to check for updated opening hours. 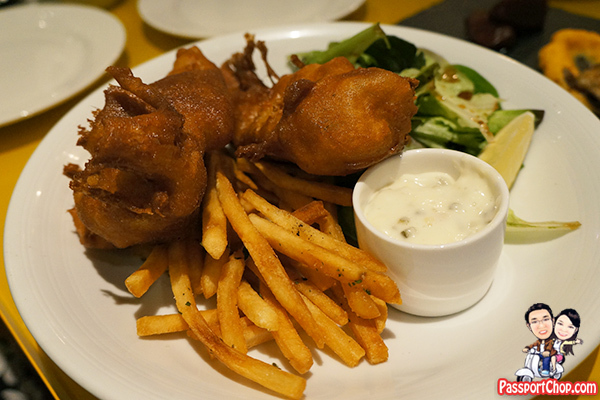 Quayside Fish Bar & Bistro brings with it an impressive menu built upon the freshest fish and seafood from around the world, in a style akin to the finest Western-style seafood restaurants. Air flown in on the day itself, simply pick your favourite item, choose how you’d like it done (or let the chefs recommend) and pair with their fine selection of wines and craft beers. Then kick back, relax, and soak in the gorgeous waterfront views of the marina. You can also “tabao” back home as Quayside Fish Bar & Bistro also provides fresh seafood retail. Quayside Fish Bar & Bistro offers an affordable weekday set lunch from Tuesday to Friday 12pm to 2.30pm. 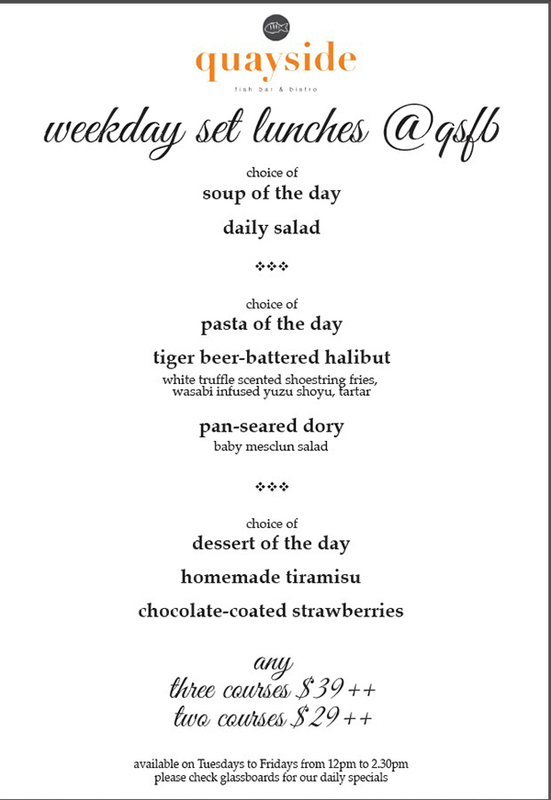 Choose from the weekday set lunch menu below – any three courses for $39++ or two courses for $29++. This weekday set lunch is very value for money as the serving size is exactly the same as that for ala carte dining at any other timings and you enjoy savings of about 30% compared to if you were to order the items ala carte. Each of the main courses available in the weekday set lunch are Quayside Fish Bar & Bistro (QSFB)’s top sellers so if you are spoilt for choice and want to try them all, bring along 2 or more other friends/colleagues to share! 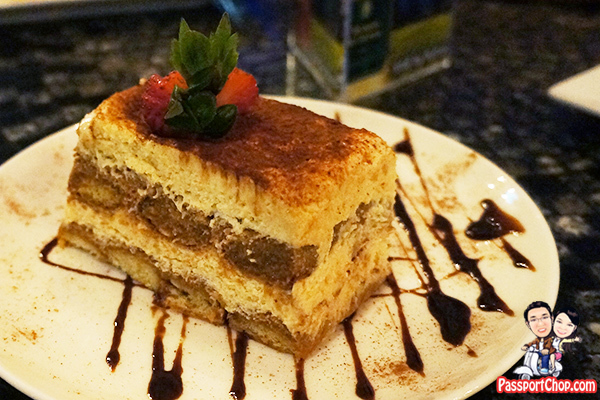 Choose the Homemade Tiramisu ($14++ on the ala carte menu) – QSFB claims that it is the best in Sentosa and some say Singapore. Personally, I would say it is definitely one of the better ones. 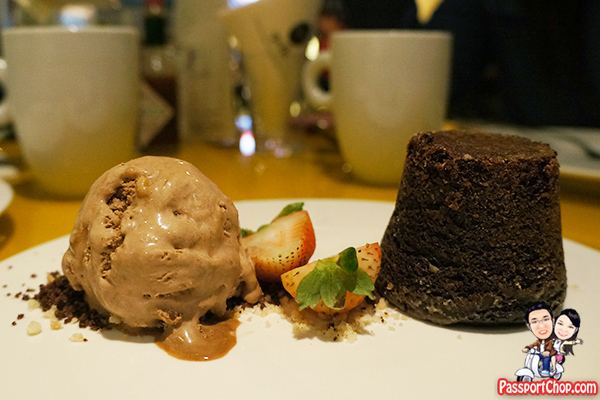 Another dessert that I would recommend you try ala carte is the White Truffle Flavored Lava Chocolate Cake ($12++). It is made with cocoa and almond and served with pistachio gelato (allow for 15 minutes preparation time). A Pan seared barramundi, with butternut puree, ginger poached pear, white wine and lobster butter emulsion ($32++) as well as Beetroot smoked salmon with mesclun, micro green, shallot rings, capers and orange rum ($18++). I will definitely re-visit to try out their new menu! Timings accurate as at time of print. 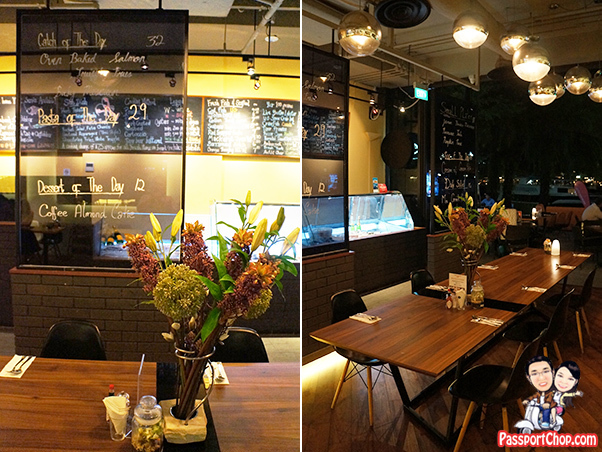 Please call Quayside Fish Bar & Bistro at +65 62688633 to check for updated opening hours. There are also Weekdays Feel Like Weekends promotions with other Quayside Isle tenants e.g. you can enjoy 15% off hair, nail and makeup services at Hera Beauty Salon or a complimentary glass of cocktail/wine with every set course dinner ordered at Museo. After dining at Quayside Isle restaurants, take a stroll along the marina and check out the many boats/yachts on display. If you are getting a taxi back, I suggest for you to wait for a taxi at the nearby W Hotel (5 minutes walk away) – if there is a shortage of taxis, the hotel doorman can help you to call for one (usual booking surcharges payable to the taxi driver). Important point to note: If you have a Sentosa Islander Pass, you can enjoy unlimited free entry to Sentosa via Sentosa Express, Sentosa Boardwalk and drive-in through Sentosa gantry. You will first need to either take the Sentosa Express – S$4 per entry (Adult and Child aged 3 and above) from 3rd level of VivoCity shopping mall or walk along the Sentosa Boardwalk to get into Sentosa. 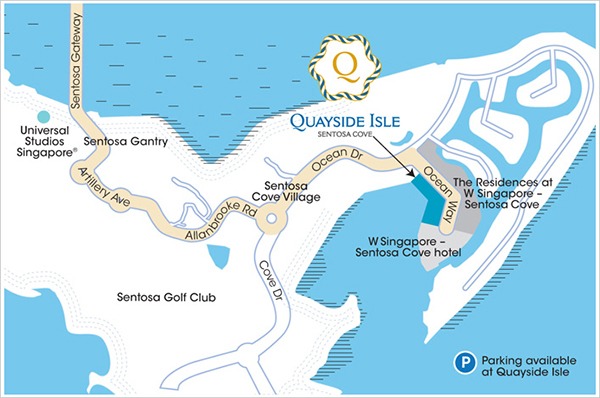 Once you are in Sentosa, board the complimentary Sentosa Bus 3 from the Beach Station Bus Interchange and alight at Sentosa Cove Village. Quayside Isle is an approximate 5-minute walk away. Shuttle bus services are available from 8am to 10.30pm at 30-minute intervals.